Finding myself with a bit of free time today, I decided to do a meditation. Not on anything specific, I just had the desire to go within. 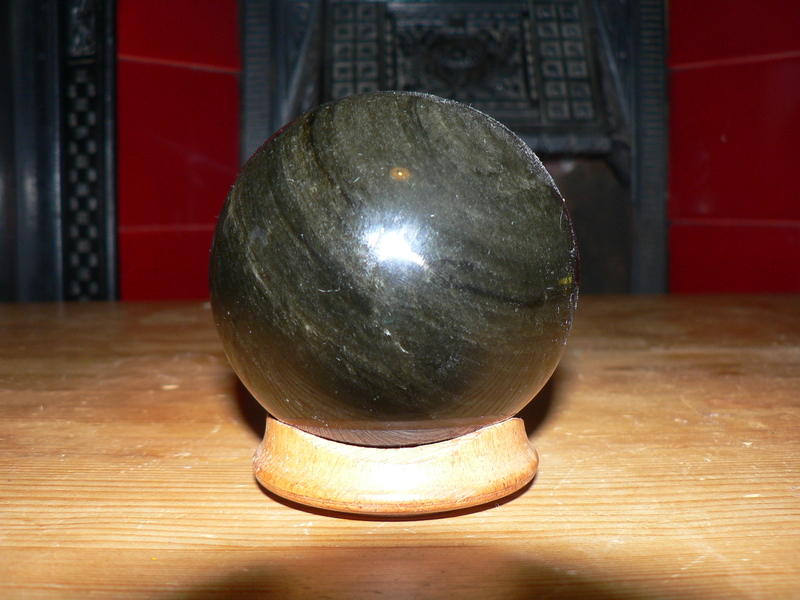 As I sat down, my beautiful Obsidian crystal ball (a gift from Neometheus), that sits on our mantel piece, caught my eye. Yes, I thought, I haven’t used that in a while. Immediately, I felt the universal energy all around me, and it zipped down within me. I felt this like a lighter-than-air feeling, bright and pulsing. After a few moments, I felt the earth energy begin to push up within me. I concentrated on that, rooting myself with it… and felt not only the ‘roots’ around (underneath) me, but a connection to mountains; volcanos; plants… this was a reminder of my connection with the Oneness of all things. The earth energy felt dark and slow as it reached up within me – the very opposite of universal energy. The two energies met inside me, entwining, like two warriors gripping arms with honourable intent. My own inner energy, my Being, combined with these two outside forces, swirling and pulsing within. Suddenly, I was with Snake. She is my Totem Spirit guide; my spirit animal. Snake has been with me for many years, and has shown and taught me much. I see her as residing in the Otherworld above my head, looking out into Space. It’s not really space, as it is just a vast blackness – it is the Void She looks out on. She does not reside or help me in the mundane realm- this, our earth realm, but is involved with Spiritual knowledge and matters. I felt a ‘gap’ from the top of my head to below my eyes; the energy was different, there was a change of ‘colour’- more felt than seen. This is the place she resides when with me, and is also the place of the 3rd eye chakra, and the place where Spiritual energy channels through into the body, the crown chakra. I greeted Snake warmly – and She told me her name. This is the first time in the many years She has been with me that She has consented to give me this information. So it was a big deal to me: I felt honoured, warm, graced, and excited. I will not share her name here, as your personal Spirit Guide’s name is as personal as a Witch’s taken name. Suffice it to say that it is something that touched me very deeply. I conversed with Snake, telling Her that at last, I was ready to learn. We sat, side by side, in the Void, looking out at Blackness. This is the first time I have done this in an Inner Journey- just sat with her, at her ‘home’. She emanated feelings of warmth and happiness, that we there together. Then, she danced: She swirled and whirled, her snake body circling and twining and moving in all directions – She was beautiful, radiant, elegant. She then showed me my Path: She shot forward-straight ahead, on a road of Blackness, emptiness, of Void, with the shape of hills and valleys on either side. All Paths are (Ultimately?) nothing. This is your Path, She said. After this, Snake shot up- and up, up, up… further up than I could imagine – I put a boundary on the ‘up’, but knew that really and truly there was no boundary. There are no boundaries – you imagine a boundary because your Mind cannot conceive of No-boundary, She said. Again we sat, side by side. Asking her permission, I slid into Snake – I became Her, to see, if possible, from Her perception. With this action, my perception of the Void opened: It widened, became deeper, I saw more of it – as if a horizon you look at suddenly expands, doubles what you take in and can see. But still I was limited by Mind – still, I knew, I did not see everything. And that was it. The whole Inner journey took a very short time – maybe 15 or 20 minutes. It had not been my intention to go on a ‘Journey’, merely to meditate. Yet I was taken on this journey – by the outside energies and my own Spirit Animal. This makes it even more extraordinary to me. The fact that I re-connected with Snake, and that she told me Her name, suggests to me that I am taking further steps forward along my spiritual Path. For the rest of the day, I have felt totally at peace, with no extraneous thoughts in my mind, and just ‘being’. I will add a post soon about connecting with Power animals/spirit guides, my relationship with mine, how I discovered them, and how you can find yours. I will add further details about the meaning of Snake spirit, as well as some others. Posted on February 15, 2013, in Meditations and Inner Journeys and tagged Animal Spirit Guides, Inner Journey, Meditation, Snake spirit. Bookmark the permalink. 1 Comment.